These are the beginning lines of the humorous and imaginative picture book, Would A Worm Go On A Walk? by Hannah C. Hall. With creative poetry, and the adorable illustrations by Bill Bolton, this sweet book will teach young children that animals are uniquely created by a loving and wise God. None of them are the same, and they are not like people, but God created them to be just the way they are. He also created people, which is His most special creation, to be just the way WE are. He loves all of His creations and, as it says in Genesis 1:31, "God saw all that he had made, and it was very good." This would be a fun addition to anyone's home library. I don't have young children anymore, but I read this book to my teen-aged special needs daughter, and she enjoyed it. She and I both smiled at the illustrations, and laughed at the silly lines. 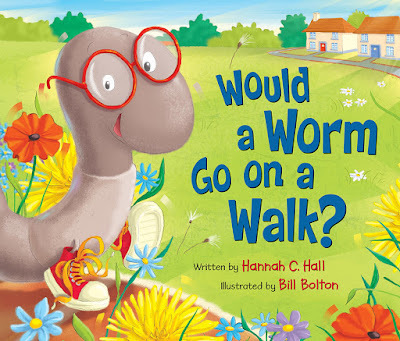 ABOUT THE AUTHOR: Hannah C. Hall is the author of best-selling children’s books, including God Bless You and Good Night and God Bless Our Christmas, as well as an award-winning blog, HannahCHall.com. Hannah lives in Prairie Grove, AK with her husband, Josh, a worship pastor, and their four children. For a chance to win a copy of this book, please fill out the entry form below. Entries will be accepted until Saturday, July 2, 2016 at 8:00 p.m. CST. One entry per mailing address. Disclosure (in accordance with the FTC’s 16 CFR, Part 255: “Guides Concerning the Use of Endorsements and Testimonials in Advertising”): Many thanks to Propeller Consulting, LLC for providing this prize for the giveaway. Choice of winners and opinions are 100% my own and NOT influenced by monetary compensation. I did receive a sample of the product in exchange for this review and post. Only one entrant per mailing address, per giveaway. If you have won a prize from our sponsor, Propeller / FlyBy Promotions, in the last 30 days, you are not eligible to win. Or if you have won the same prize on another blog, you are not eligible to win it again. Winner is subject to eligibility verification.